The social problem of infant abandonment captured the public’s imagination in Italy during the fifteenth century, a critical period of innovation and development in charitable discourses. As charity toward foundlings became a political priority, the patrons and supporters of foundling hospitals turned to visual culture to help them make their charitable work understandable to a wide audience. Focusing on four institutions in central Italy that possess significant surviving visual and archival material, Visual Cultures of Foundling Care in Renaissance Italy examines the discursive processes through which foundling care was identified, conceptualized, and promoted. 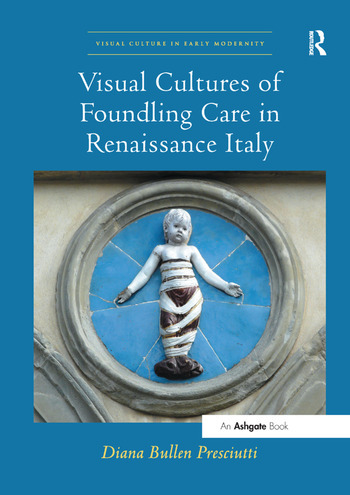 The first book to consider the visual culture of foundling hospitals in Renaissance Italy, this study looks beyond the textual evidence to demonstrate that the institutional identities of foundling hospitals were articulated by means of a wide variety of visual forms, including book illumination, altarpieces, fresco cycles, institutional insignia, processional standards, prints, and reliquaries. The author draws on fields as diverse as art history, childhood studies, the history of charity, Renaissance studies, gender studies, sociology, and the history of religion to elucidate the pivotal role played by visual culture in framing and promoting the charitable succor of foundlings. Table of Contents to come. Diana Bullen Presciutti is Lecturer of Art History at the University of Essex, UK. "[The book] is a sharply focused look at the figurative imagery deployed by hospitals caring for orphaned and abandoned children. ... A significant addition to our understanding of the multivalence of visual language in the Renaissance city, elucidated through focused analyses of images and deep probing of textual sources." "Presciutti's study makes valuable contributions to our understanding of charity and charitable institutions in early modern Italy. ... Presciutti's analysis of the visual culture of institutions such as the Innocenti in Florence and Santo Spirito in Rome contributes most to a richer understanding of the rise of the visual cultures of charity in the early modern period." "A rich and original study full of revealing insights. Presciutti shows how much more we can learn about the foundling homes of Florence, Rome, and Bologna when we compare them systematically. Working through many archives for documents and images, she is masterful in her interdisciplinary treatment of visual culture as a means of advertising and 'branding' foundling homes at a time when public acceptance of these new forms of institutional charity was far from certain."